Film maker and writer Terry Jones has worked with BBC to document his discovery of a colony of penguins, which are unlike any other penguins in the world. 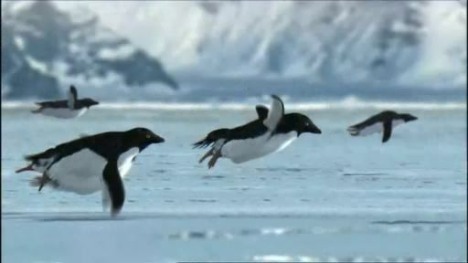 These penguins, Jones explains, don’t need to huddle like the penguins in March of the Emperors. They get to escape to South America. This unmissable impossible sight is just one example of material that can be seen on BBC’s online iPlayer. The Flying Penguins spot was developed for release on April Fool’s Day at Rainey Kelly Campbell Roalfe/ Y&R, London, by creative director Mark Roalfe and creative Paul Silburn. Filming was shot by Gorgeous director Vince Squibb with Red Bee Media producer Sarah Caddy. Animation was directed by Darren Walsh via Passion Pictures, with producer Belinda Blacklock.